Want to Know a Secret? 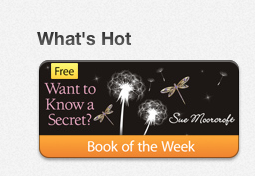 is Book of the Week on Apple iTunes! In case you don’t use iTunes much, that means it’s also free this week. If you download it, I hope that you like it. I had a lot of fun with that book, because I had to construct a double life for someone, and then allow it to affect someone else. It suited my plotty little mind. Money is an emotive subject, as I used to be told on training days when I worked in a bank. Some people, quite unexpected people sometimes, will act very badly when money is at stake. How important is money to you? What would you do for it? Would you put it ahead of someone you love …?